Could do with closing my eyes: poor night's sleep. Me too Alehouse (bad night). I was just trying to decide on lyrics. Hazel - Grace is a sort of lurcher, daddy was a three quarter greyhound (we think the missing 25% was probably collie or spaniel) and mummy a big working whippet so she looks like a slightly short, slightly stocky greyhound. When younger she loved to run with us but she's thirteen and a half now so those days are long gone unfortunately. Hope you feel better today RFJ. Is it the new job wearing you out? Did you find your keys Wabo? Are you over whatever it was now Gobi? Friday's lyrics were get me to the church on time from my fair lady. Why: small accident yesterday left me being rescued from Cape point and in the hospital with a suspected broken foot (luckily it's not broken but as I can't put any weight on it, that doesn't make much of a difference right now). Lmh that is a fantastic result, well done! Villiersdorp was tough ale! Trail and very hilly. Beautiful though. Did just over 30 min, 2nd lady and 9th overall. 41 runners there(mostly Africaans speaking) and 21 women. Chick yay parkrun in Hamburg! Gobi hope you're feeling better. May see if I can get in the pool later though I may need to be carried there! Oh dear Emz! Ice and elevation? Benjy: I don't listen between 12 and 2. Ever. I am, though, very much a radio programme: usually 2 or 5. Oh dear emzap that sounds a little dramatic - what happened to make you pass out? I hope that your foot recovers quickly, have they said what damage you have done? I have to switch off between 1200-1400hrs too Alehouse. I've introduced MiL to having the radio on as company too and she's found it helpful but also dislikes Jeremy Vine. Ale yes. I felt something snap when I went over though so not hopeful for a short recovery, we'll see... Also the doc had no crutches left so I can't even get around the house. No crutches? Be careful swimming if you think it's a ligament or tendon emzap - the flexion may not be good for it. LmH / Benjy - you asked about races. I'm once again leading the club's marathon sessions so tentatively planning on doing one or two. As you know the knee was causing problems (about 85% back to normal now) so although I have the endurance, the speed isn't quite back yet so have no huge time expectations. 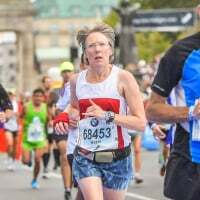 I'm in the Great Welsh Marathon (April 14th) and may do Milton Keynes comfortably (early May) as a couple of first timers I'm coaching are doing that one. Likely to do Brecons mid May for fun. Before that, Cross Country - Southerns next weekend (Parliament Hill) and am entered into the Nationals (Leeds) but not sure I'll do that one. I'm also in Fleet Half (March). Seems several of us have sleeping issues at the moment. Ouch emzap nasty. Would definitely rest it. Can you keep hassling them for crutches? Hope that Grace will be with you for a time yet LMH - nice mixture. What: social run with my Tuesday group this evening. Why: Could do with some chat. Should have a rest day really but will do that tomorrow. What: 10k/6 miles easy run commute to work. Maybe another 3k/2 miles home again in the PM. Why: Miles. And I need to get to work. LMH: "If only they'd get rid of Jezza Benjy........" (chuckle), just like those words like 'said' and 'friend' that are spelt differently to how they are pronounced, Jezza in pronouced Elaine Paige. Espen: Great way to run, building it in to commute. Emz: Blimey Emz hope it sorts itself out, otherwise great result in Villiersdorp. Dustin: Bloody Nora Dustin, that's one mighty schedule, sounds very busy. That's admirable leading the marathon sessions. Brecon's sounds tough, I'm guessing it is all up and down trails? Ale: I am dissapointed, get that radio stuck on 2 at 12PM, there will be topical debate about how car doors each have their own unique 'accent' like speech in their squeek when closing the doors or how Brexit will affect our taste buds and perception of Crunchy Nut Cornflakes (or something like that). RFJ: You do right, sometimes it is just right to cut it short, tiredness is the enemy. What: Lunchtime run 12PM, not sure how long today, think it will have to be a 7 (Time may only allow a 6 today). Taekwondo tonight. Keys are found! They sort of were where I thought but had slipped off the hook! dustin enjoy your marathon training! why: back, cos I carried Lyla downstairs and she is not a little 2 and half year old!!!! I have to be honest and say I am not 100% but I am eating and functioning pretty normally. LMH - marathon legs gone ? Glad to hear you're feeling better Gobi. Not sure what you mean? Good news on the keys Wabo. Nice schedule you have there Dustin. I must admit I don't like Elaine either Benjy - she gets switched off too. It's good to be flexible Hazel - hope you enjoy your social run. Hamstring tweaky and stomach dodgy but it was quite nice out apart from being it blowy and I'm worried about the weather for the rest of this week with snow and possibly ice forecast so I ended up doing a probably not very sensible long run. I shall have to keep the hamstring moving this afternoon and hope for the best. Have just heard that FiL is being moved to a local unit which should make life much easier. Now have strapping to immobilise foot (turns out hospital should have done it yesterday, not just sent me home). Still no official diagnosis other than "not broken". Got crutches which we went to pharmacy and bought in the end and letter to show the airline! What a palava! Another bad night sleep here again but think it is this cold. Em: Goodness me be careful with that foot! !How are you feeling? Dustin: a local one to me The Great Welsh I maybe doing the half. Hazel: Your training is always so focused and thought out.I hope you can sleep better tonight. Benjy: I hope your run went well was it 6 or 7? LMH: that is good news on FIL. LMH- didn't you run 26.2 at the weekend ? Healing vibes to you, em. Scary experience!! Glad the car keys turned up again, Wabo. Great long run, Hazel. Enjoy the social. Benjy: been a huge fan of Zoe ever since she did that tango on Strictly. Bloody brilliant. That's really good news about FiL, LMH. Hope it means you get your life back. Not so good re. hamstring and stomach. Nice couple of races, Dustin.